Everything seems cuter in nautical stripes:) And the best part is? You can add them as staples to your wardrobe because navy and white is classic and will not be going out of style any time soon! With a fresh blanket of snow on the ground in the last week of February, I am DYING for spring to get PRONTO! IHOD blog made it to the top 10 Design blogs on the Lovelies Awards! Thank you so much for those of you who voted already! Seriously, you guys are fantastic. Still need your help- It ends the 28th! Would love to have your support! Go vote here! Last but not least, so thankful to Michelle for the feature in her things she's loving post. You are a dear! what a cute roundup! i always love stripes and never get sick of them, glad they're back in a big way! Oh I love the tshit on the top right and that bag- stripey perfection! I've always loved back and white stripes but I've never been sure how to wear them. I think that bag is my solution! Happy weekend, Anna -- and congrats on making it to the top 10 in the Lovelies. I'm off to vote. I love patterned clothing including stripes! Congrats on the handbag that you won! Voted for you! Hoping you'll follow back..
You're right, stripes make everything 10x cuter :) I'm headed over to vote for you! I just love stripes, seriously they are a classic! Happy weekend to you, Anna! gotta love stripes. that crop top is too cute! great roundup. I too am dying for spring to arrive!! 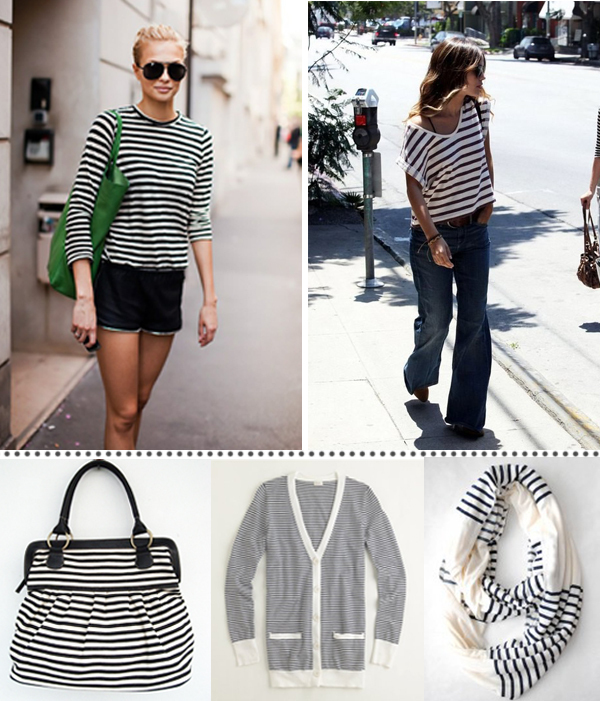 Always a fan of the ever-lovely striped T!! Great roundup, Anna! I sure do love me some stripes. Especially baggy saggy ones like photo #2!! :) favorite!!!!! And I voted for you on the Lovelies! Fyi, check your link on "Go vote here" - when I clicked on it, it linked to lisaroy! what is it about stripes? i just am always drawn to them. i truly don't think they'll ever go out of style!! you're too sweet. but its true! love the line. and those stripes!!! Oh Anna, I just love all of these!! Your web page for your Etsy looks absolutely amazing! I am loving Rachel Bilsons look! The way that you put things together never ceases to amaze me ... Fun, fun, fun! such a nice post. and what a wonderful blog- just found you. i'm loving stripes right now too. lovely blog! I just love stripes! They are so versatile. I love pairing a striped top or cardigan with a floral piece. Man, that cardigan looks sooo comfortable!